The popularity of social networks continues to rise, but there are more of them than you can shake a stick at. See, for example, our recent coverage of social networks for families, dog lovers, teens, tweens, and even old fogies. In a fragmented world, where OpenID is still far from standard with social networking sites (just look at the OpenID directory), there’s definitely room for a third party to fill the gap. Loopster is the newest application, along with Profilactic and ProfileLinker, trying to help people wrangle these disparate networks into an easily consumable, unified format. Profilactic focuses on aggregating your social network data and creating feeds that are mashups of the different content you and your friends produce (MySpace blogs, Dugg stories, etc.). ProfileLinker focuses on creating a single interface to all of your social networking accounts, notifying you of friend updates, messages, and search all your networks at once. They are continually adding new networks to their collection of 75 so far. Loopster takes a more basic approach than Profilactic and ProfileLinker, aiming to be a “RSS feed” for your friend’s updates across the multiple networks (although they don’t actually offer a RSS feed yet). 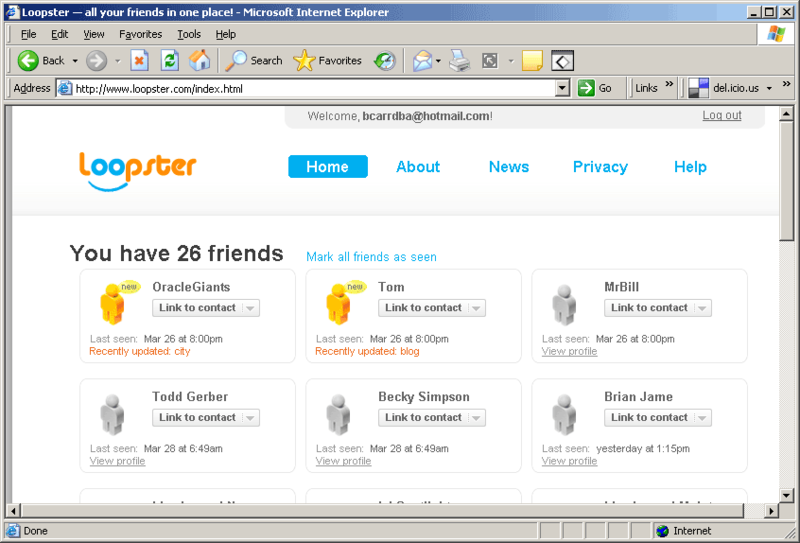 Once you’ve registered with Loopster, you hand over your credentials for MySpace, LinkedIn, Facebook, Live Journal, or your Blogger user name and click “Add”. This gets Loopster’s crawlers working. They log in to each of these sites on your behalf and traverse your friend network, grabbing their names, bios, interests, and details (this takes quite a while). 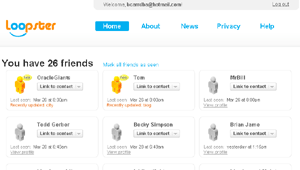 You interact with your friend’s profiles through a main page with a grid of all of your friends from each network. Whenever a friend’s profile is updated, their profile lights up with a “new” icon and a note about what has changed. You can either click through to Loopster’s summarized version of the profile or click directly through to the original source. Since you probably have some overlap between the friends in each of these networks, Loopster also lets you merge together profiles of the same person from different networks. However, the program is still a little buggy and I wound up with multiple copies of the same profile. This was probably due to some impatient clicking of the “add friends” button, which sent multiple crawlers to the same site, grabbing the same info. The off label methods these sites use to crawl social networks puts them in a somewhat precarious position. MySpace doesn’t have an API for its site, and has been known to send some nasty C&D letters to people who crawl their network. Singlestat.us is one MySpace victim and their competitor DatingAnyone is also dead. Sites like Loopster are a sign of a mini revolution happening with the social web, where instead of managing and linking documents, we are managing and linking personal identities. Traditional search engines like Yahoo and Google are very poor at discovering and managing this information since social relationships aren’t always hyperlinked. This is the gap that sites like Wink, Streakr, and semantic web startup Metaweb are trying to fill.